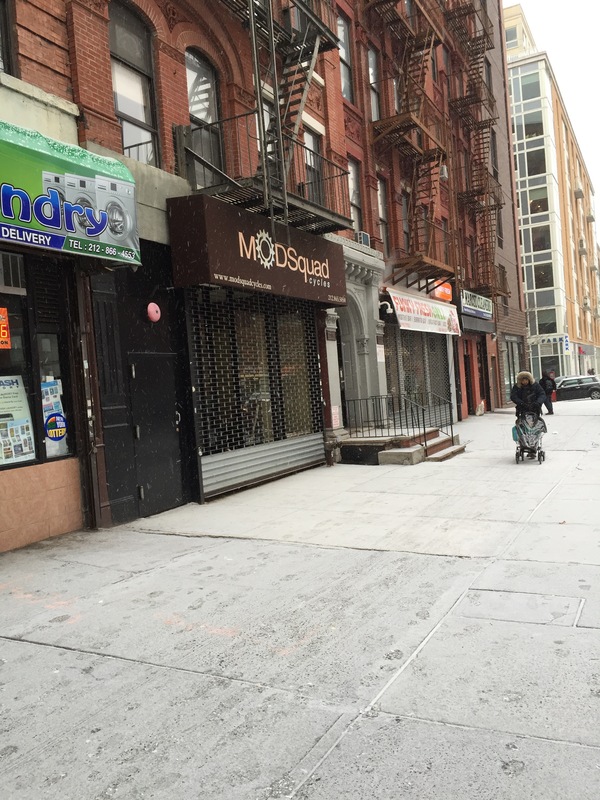 Harlem Skin Clinic | HarlemGal Inc.
Is Harlem Skin Clinic moving into former ModSquad space on FDB? Happy New Year Harlem! Hope everyone had a fabulous holiday! We are back in Harlem after two weeks away and we noticed some activity outside the commercial space where ModSquad, the bicycle shop, use to be, which was on Frederick Douglass Blvd between 114th and 115th Street. We asked the folks standing outside whose moving in? We were told Harlem Skin Clinic. This business has been house inside Land Yoga space since the Ashantga center opened more than two years ago. Looks like they are branching out and getting their own space. Good for them and continued success! Harlem Park to Park kicks off its fourth annual Spring Harlem Restaurant and Retail Month tomorrow (Feb 15) with an impressive list of restaurant and retail establishments in Central Harlem. With food options like Ristorante Settepani’s Braised Monkfish, and the Chicken and Red Velvet Waffles at 67 Orange Street; along with services that include a week’s worth of Unlimited Led Classes from Land Yoga, and the popular Men’s Razor Relief Treatment at Harlem Skin Clinic, Harlemites and visitors alike can experience a variety of options and opportunities to sample Harlem’s finest offerings from February 15 – 28. For more information about Spring Harlem Restaurant and Retail Month and a full list of offerings, visit Harlem Park to Park on Facebook or link below for prix fixe menus and retail/service items. The Frederick Douglass Blvd Alliance based in Harlem came together this past January and already they are hard at work creating events for us Harlemites to enjoy and to help others. First on their to do is the Food & Drink Boulevard event taking place on May 10. On that evening patrons can enjoy $5 drinks and appetizers at several Harlem dining establishments by purchasing tickets for $10 in advance on Eventbrite.com. And proceeds made that evening, a portion of it will be donated to The Boys and Girls Club of Harlem. See you on May 10 along Frederick Douglass Blvd! It is that time of year again…where Harlem Park to Park presents Harlem Restaurant and Retail Month for the month of March! 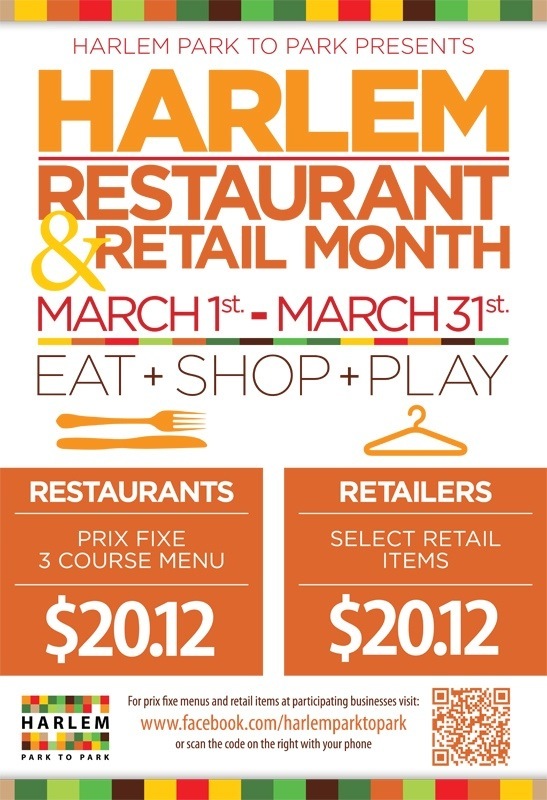 Starting March 1 and running to March 31, a select group of Harlem businesses will be offering prix fixe menus and select retail items all for $20.12. 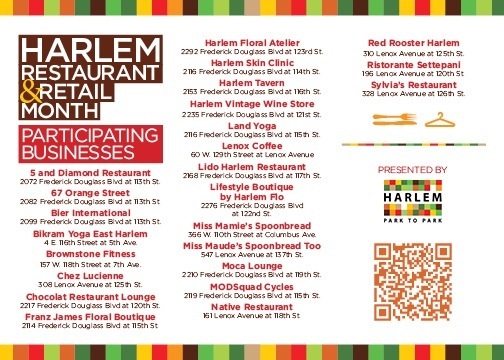 Check out the list below and head on over to your favorite Harlem hangout this month for Harlem Restaurant and Retail Month! 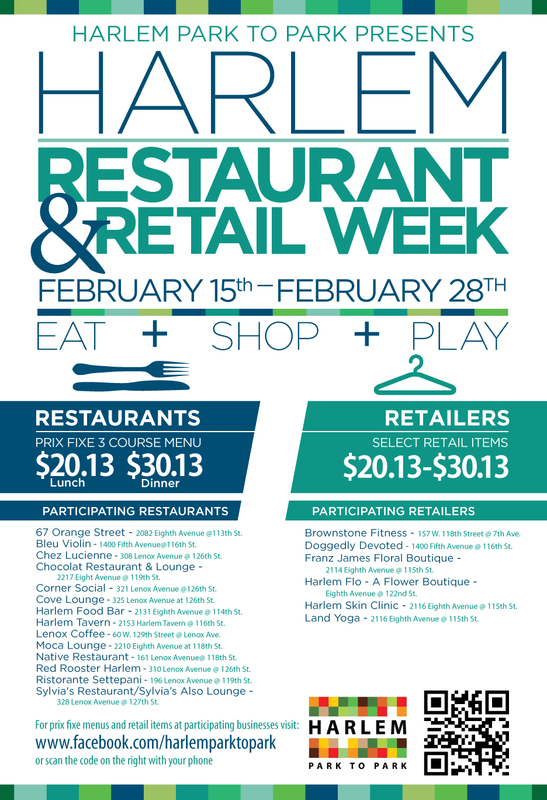 Harlem Restaurant and Retail Month continues, don’t miss it! Harlem Restaurant and Retail Month is happening right now and there is still plenty of time to get out there and enjoy the benefits. The month-long event which takes place twice a year in the Spring and Fall, showcases Harlem’s premiere restaurants all located in area of Central Harlem, from Morningside to Marcus Garvey Parks and 110th to 125th streets. During this month, diners can enjoy a prix fixe meal at any of the participating restaurants for $20.11; and shoppers can purchase select items at retail stores for $20.11. The promotion runs to October 31. The restaurants that are participating include: 5 and Diamond Restaurant, 67 Orange Street, Chocolat Restaurant Lounge, The Harlem Tavern, Lido Harlem, Moca Lounge, Native Restaurant, Nectar Wine bar, Red Rooster Harlem, Ristorante Settepani. And for retail, the following places are participating: Bikram Yoga East Harlem, Brownstone Fitness, EG Bodywork, Franz James Floral Boutique, Harlem Flo Floral Atelier, Harlem Flo Lifestyle Boutique, Harlem Skin Clinic, Harlem Vintage Wine Store, Karrot Health Food Store, Katrina Parris Flowers, Land Yoga.